On Monday, March 11, 2019, at 5:00 P.M. Southeast Special Response Team Officer Dillon Biggs and Officer Sukhbir Chauhan were proactively patrolling the area of Third St and Madison Ave in an effort to reduce gang violence and shootings in the Southeast Policing District. They initiated a traffic stop for a vehicle code violation. They contacted the driver, 19 year-old Amador Carlos Martinez, a self-admitted Ruthless Thug Life Fresno Bulldog Criminal Street Gang Member. Martinez admitted to Officer Biggs he had a loaded 44 Magnum revolver under the driver seat. Martinez said he possessed the firearm for his protection against other gang members. 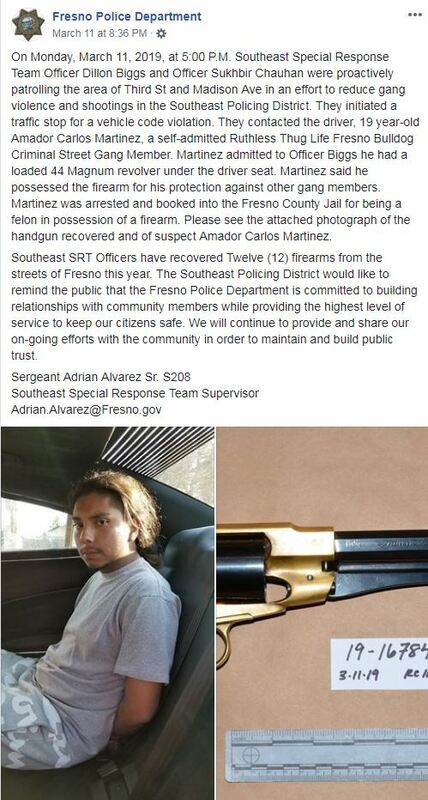 Martinez was arrested and booked into the Fresno County Jail for being a felon in possession of a firearm. Please see the attached photograph of the handgun recovered and of suspect Amador Carlos Martinez. Southeast SRT Officers have recovered Twelve (12) firearms from the streets of Fresno this year. The Southeast Policing District would like to remind the public that the Fresno Police Department is committed to building relationships with community members while providing the highest level of service to keep our citizens safe. We will continue to provide and share our on-going efforts with the community in order to maintain and build public trust. Jenkins, ready my steed. There is villiany afoot. He’s taking the term “Bustin’ a Cap” to an entirely new level. I didn’t know they came in 44 mag. Brass frame no less. Holy Cow! I have two of those “Gangsta” weapons in my safe right now! And I have a Gangsta long gun in kit form waiting to be finished. Did he actually admit he had a “.44 Magnum” under the seat or did the reporter embellish for effect? That was straight from the Fresno Police Dept. Facebook page, no reporter involved. And then you got your Ruthless Thug Life Fresno Bulldog Criminal Street Gang. You suppose the initiation is ANYONE THAT DOESN'T BLEED TO DEATH WHILE GETTING THE TATTOO BECOMES A MEMBER? David Berkowitz was originally called THE 44 MAGNUM KILLER, because, you know, ALL 44s are magnums. Then cop ballistics said the gun was a Charter Bulldog, which wasn't a magnum. So he became THE 44 CALIBER KILLER. Then there was the note explaining that he followed the orders of Sam the dog. He then became Son of Sam. Dude that sold it to him said it was a 44 magnum. You know, the most pwerful handgun in the world that will take your head clean off. No doubt the other gang bangers gave him a wide berth. Since it was on the police social media page I would say it was the cops. I am curious. Was it loaded and how did the cops unload it if it was? You beat me to it! 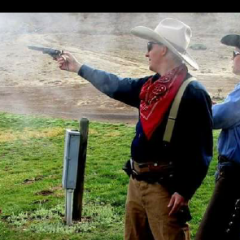 If it was a Colt Walker you could say it was a 44 magnum equivalent. That was probably a positive thing. It self-identifies as a .44 Magnum. How dare you question it's self-identification, you filthy caliberists. Well, the perp had it correct, only .44 calibers are true revolver cartridges. Oh wait this was a muzzle stuffer. Don't laugh, guys. The gun haters would be perfectly fine with banning even muzzle stuffers as well. Once I had a rather interesting conversation with a woman who thought even water pistols should be banned since they promote violent aggression in children. Okay... Fresno Channel 30 had some coverage... locals are having fun with this! FRESNO, Calif. (KFSN) -- If you go to the Fresno Police Department's Facebook page there is no shortage of posts about recent arrests and criminal activity. However, a post on March 11 caught the eye of thousands of people on Facebook. It showed a 19-year-old gang member who was taken into custody after admitting to having what looks like a loaded Remington 1858 "New Army" Revolver. - "When you want to rob a store at 6 a.m. but the Alamo needs remembering by 8." - "The serial number on that gun is #1"
- "If it pleases the peasants; brave constables wish to inform us that they have apprehended a young rapscallion armed with a pepperbox whilst operating his horseless carriage." - "Jenkins, ready my steed. There is villainy afoot." - "You've Yee'd your last Haw!" - "What in the Revolutionary war is going on here?!?!" In all the post has nearly 27,000 shares and more than 17,000 comments. That dork doesn't look smart enough to pee a hole in a snow bank. This would all be funny if it weren't so tragically stupid. Will be interesting what the anti's do with this one. Maybe he purchased it on line since no paper work is needed through an FFL. Now the anti's can go after purchasing these type of guns on line or at the store because a felon can do it and get away. This type of weapon can kill someone like any other. Now, if I was worried about the Jets or the Sharks coming after me, I would have said "protection against members of other gangs". But since he carried it for protection "against other gang members", that sounds like he's afraid of his posse. Other members of the "Ruthless Thug Life" whatever. Like us grammar Nazis keep saying, "Words have meanings". Kinda my thoughts too, Forty. The lawyers can have fun with this. Aren't percussion guns not considered firearms under the ATF reg's. So technically he wasn't carrying a firearm!